As a client of Sparrows Capital, you will be benefitting from an approach rooted in evidence-based research. We are committed to applying techniques derived from robust academic studies for the benefit of our clients and would like you to have a clear understanding of the principles that we stand by. Our investment philosophy reflects the objective lessons of over a century of investment history, applied systematically and unemotionally. • it is critical to remain invested across the full cycle. In this educational section you will find an explanation of each of these styles and their relevance to portfolio construction. We also provide access to learning resources in the form of Academic Papers, Sparrows Capital White Papers and Recommended Books. Please do get in touch if you would like to discuss any of this in more detail. EBI is effectively the real-world manifestation of Modern Portfolio Theory, an investment approach envisioned by Nobel Economic prize-winners. Investing often relies on a deeply embedded set of assumptions. In many instances this accepted wisdom is not supported by objective analysis. We have access to market data covering 100 years of investment history, and a wealth of robust academic studies. Important lessons and conclusions can be derived from these studies and applied to investment processes. These insights can help identify and avoid the pitfalls which often erode portfolio performance. 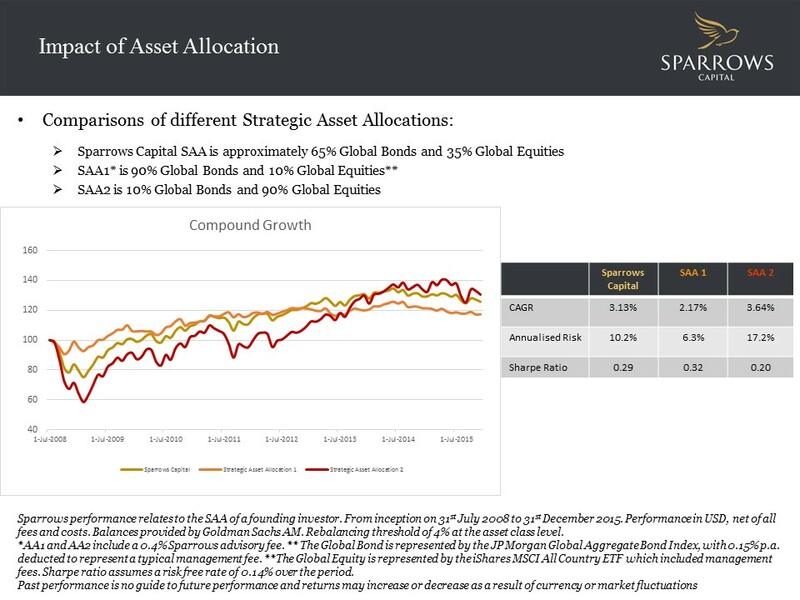 Portfolio performance is primarily a function of Strategic Asset Allocation, and more specifically the extent to which the investor chooses to be invested in equities, as opposed to fixed income or cash. The SAA is responsible for up to 94% of portfolio returns, and is the most important element of the investment process. The evidence shows that Alpha is elusive, that very few asset managers possess the requisite skills to generate added value through stock picking or market timing, and that those managers that do add value tend to do so over a limited period of time (and tend to absorb the lion’s share of that value in fees). Strategic investing eschews the concept of active management, at least in relation to the core liquid portfolio, and focuses on delivering the market return (beta) corresponding to a given risk profile across the full market cycle. The approach uses highly efficient ETFs and Index Funds to deliver market returns with minimal friction. The portfolio is regularly rebalanced back to its original risk allocation, but there is no subjective attempt to anticipate market moves via tactical overlays. Strategic Investing involves harvesting market returns (beta) across the cycle as efficiently as possible. There is no attempt to time markets or to pick stocks. This objective approach avoids many of the behavioural biases which so often erode portfolio performance. It is estimated that an investor’s strategic asset allocation explains some 94% of portfolio returns. This means that the allocation of risk across asset classes and across geographies is quite simply the most important decision in the investment process. Risk based investing focuses on the individual investor’s risk tolerance and financial capacity to assess the appropriate level of portfolio risk. 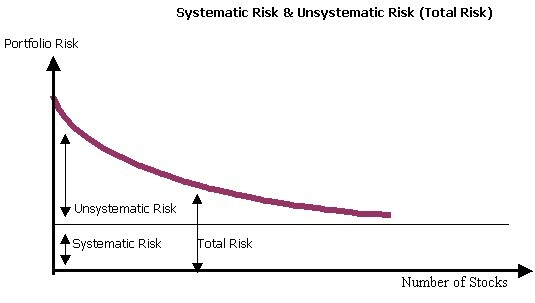 Importantly, risk is never dialled up in order to meet an investment objective; if the appropriate risk allocation is not capable of meeting the desired outcome, then either the objective must be reassessed, or the invested amount must be increased through additional savings or transfer. Long-run return is a function of risk, but risk is associated with volatility. Calibration of a strategic asset allocation to the investor’s risk profile is critical: too little risk and the portfolio will disappoint over the long term; too much risk and the investor will succumb to psychological pressures during market swings, eroding long term performance. Incorporating strategic exposure to specific risk factors or to combinations of risk factors can enhance a portfolio’s expected risk-adjusted returns across the cycle. 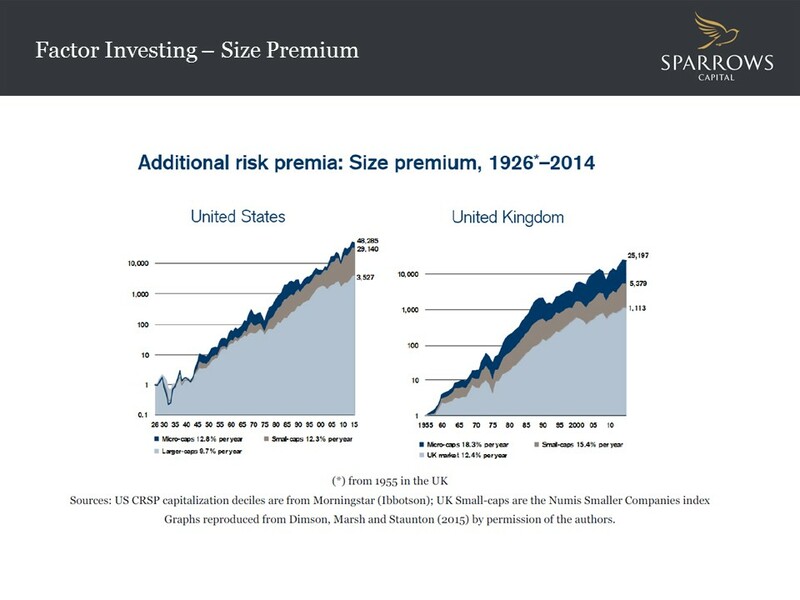 The market has historically awarded a persistent risk / return premium to certain risk categories. A factor-based approach favours these categories with a view to improving portfolio performance across the cycle relative to traditional index benchmarks. The costs of investing can be substantial, and comprise investment management charges, fund charges, custody and transaction costs. A major benefit of strategic investing is its use of ultra low cost investment vehicles, including ETFs and Index Funds. 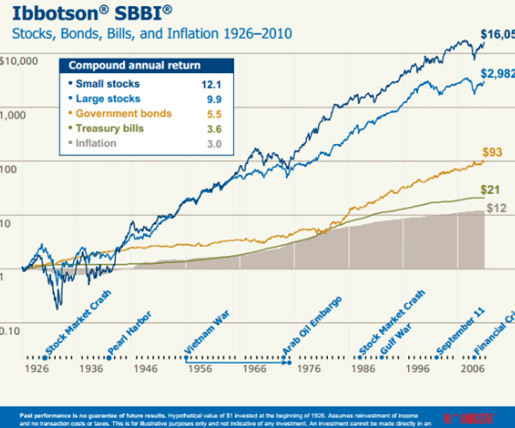 Compounded costs can erode a substantial part of your portfolio’s long term returns. Across your whole investment portfolio you need to have a clear picture what you are paying for and how the added value compensates for the additional costs. Strategic investing involves low-cost instruments, and produces very low turnover rates, and focuses on delivering market returns as efficiently as possible. Management, custody, vehicle and transaction costs and fees are often intransparent, complex and substantial. It is critical to ensure that fees are appropriate for the service being provided, and that they are justified by the value added. 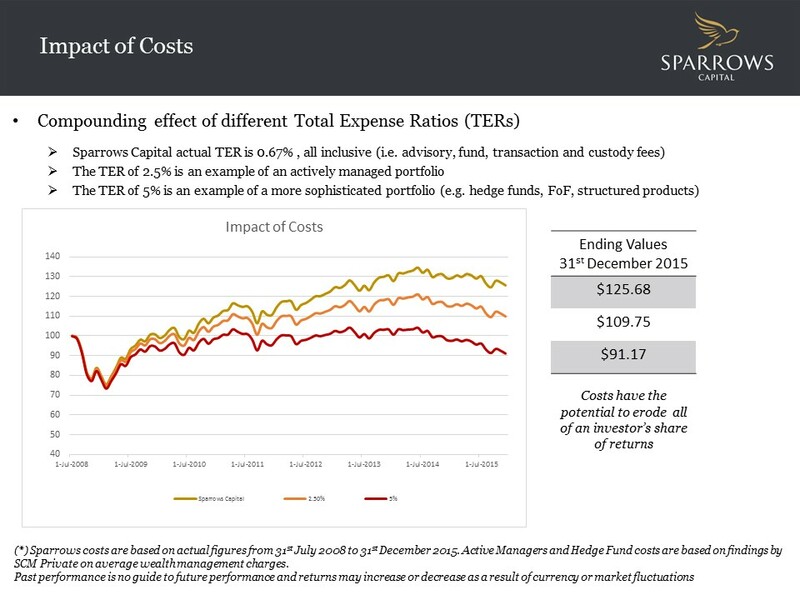 The graph illustrates the effect of different fee levels on portfolio performance over a 7 year timeframe, underlining the outperformance hurdle required by active strategies just to cover their charges. 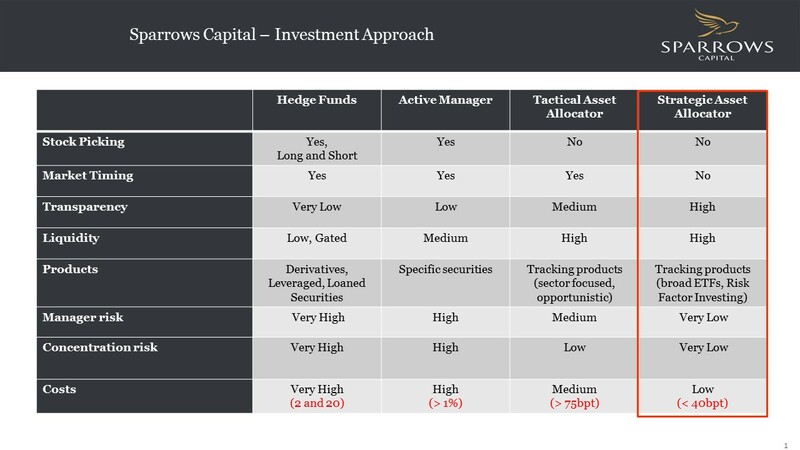 By allocating across the entire liquid universe and by using broad market ETFs and index funds, Strategic investing delivers the benefits of multi-layered diversification. Diversification is the closest thing to a free lunch an investor can find in the financial markets. Diversification allows reduction portfolio risk without sacrificing long term expected return. Strategic investing also provides you with the benefit of strategy diversification and access to uncorrelated investment approaches. Diversification acts to distill the risks down to the targeted systemic market risk, without reducing expected portfolio returns. This improves the portfolio expected risk / reward profile (expressed as the Sharpe Ratio). Why are traditionally “active” funds using traditionally “passive” products like ETFs? A genuinely passive investment approach involves an objective, rules based approach to markets, the building blocks for which are passive ETFs and Index Funds. At the same time many active market participants adopt a hybrid approach, and express active macro views using efficient passive instruments. In doing so, these participants are foregoing one potential source of alpha, stock selection, and are focusing their effort on extracting outperformance (alpha) through market timing. This style relies on subjective decisions and manager skill, and is therefore not a passive approach, although it is often presented and marketed as such. What is the role of tactical asset allocation? Tactical asset allocation is another euphemism for a strategy which attempts to extract outperformance (alpha) through market timing, by identifying asset classes which are overbought (or oversold) and decreasing (or increasing) portfolio exposure to such asset classes. Empirical studies demonstrate that the vast majority of managers consistently fail to add value through tactical allocation, and indeed tend to destroy value through such decisions. A genuine passive strategy does not involve tactical allocation. With over 1,500 ETFs listed in Europe alone, how does an investor know which one to choose? The passive universe contains not only ETFs but also index funds. Portfolio construction should begin with a high level risk allocation process focussed on the investor. This should then be expressed as a benchmark in the form of a granular set of indices representing the relevant investable universe. The ETFs tracking the benchmark indices must then be screened for methodology, tracking error, liquidity, costs, tax efficiency, structure and counterparty risk. Why pay a manager to select index funds and ETFs? Can’t anyone do it? If the intention is to select a single product, then an investor can indeed self-select on the basis of product sponsor and cost. But single products tend to focus on large cap companies in major market, and they fail to address the full investable universe, the full market. This approach also forgoes the benefit of applying factor tilts to the portfolio (see below). Employing an adviser also improves discipline, facilitates consistent rebalancing, reduces an investor’s behavioural bias and reduces the tendency to make ill-timed subjective decisions. Should all of your portfolio be in ETFs and passively managed? We advocate a core / satellite approach, with the core portfolio invested passively with a view to harvesting market returns (beta) as efficiently as possible. This can be complemented by a number of specialist satellite products / strategies intended to capture alpha or to access other risk premia (examples might be private equity or real estate holdings). It is important that the investor fully understand why and how each satellite strategy will add value, and that their performance is rigorously reassessed on a regular basis. How do you know when you should rebalance? The primary purpose of rebalancing is to ensure consistency of portfolio risk. As with all aspects of a passive strategy, rebalancing must be carried out objectively in accordance with pre-defined rules. Much work has been done to identify optimal rebalancing frequencies, thresholds and timing, but ultimately the most important component of a rebalancing process is discipline. Academic studies have revealed that certain sub-sections of the market have persistently experienced higher returns than the broader market. Factor investing tilts the portfolio, again using a rules-based approach, towards these rewarded risk factors. The resulting strategy remains focused on harvesting market returns (beta), but the components of the market are weighted toward persistently rewarded factors (selective beta). Modern portfolio theory relies on a multi-asset class approach to ensure multi-layered diversification. We advocate liquid, global, multi-asset portfolios comprising ETFs and index funds which, in turn, ensure maximum diversification within each investment layer. If everyone is rushing into passive investing, what is the future for asset management and hedge funds? The emergence of highly efficient passive investments is forcing active managers to up their game substantially. Managers with low active share (including closet indexers) will be competitively forced to lower fees and increase efficiency; we are already seeing related merger activity as this industry looks to consolidate and achieve economies of scale and scope. Smaller active managers will be forced to increase active share and focus on genuine consistent alpha production in order to justify fees and remain viable. We expect the industry to be smaller and more competitive in the future. Is passive investing a fad in a rising market? What happens when markets fall? Passive investing has been practiced since the 1970s and has stood the test of the global financial crisis. By definition, an investment designed to replicate the market return will efficiently track markets downwards as well as upwards, but the important question is whether this outcome will be better or worse than that of a managed investment in the same conditions. Our analysis shows that managers succumb to the same behavioural biases which are known to damage the performance of individual investors in turbulent markets, and that attempts to protect a portfolio from volatility tend to significantly destroy value across the cycle. In this edition Raymond Backreedy looks at recent market volatility and advocates a steady hand. A comprehensive review by Larry Swedroe of the disingenuous claims made by some market participants about the dangers of passive investing. Worth a read! Yariv and Elroy – WM Centrefolds! Yariv Haim and Elroy Dimson feature as the cover story for Wealth Manager Magazine. Yoosof Farah interviews Sparrows Capital and explores the company's history, philosophy and unique business proposition. Yariv takes a wry look at the philosophical issues affecting investment behaviour. The universe has a funny sense of humour! Raymond Backreedy discussed the difficulties of picking a market entry point - and the very real cost of being uninvested while doing so. The reality of the impact of investment skill Mark Northway looks at whether investment performance for charities is really generated by the skill of the fund manager and how passive strategies contribute to charity portfolios. Evidence based portfolio design Can passive become the new active? Yariv Haim reviews lessons learned from active and passive investment approaches, and proposes an enhanced evidence-based portfolio design on the basis of his findings. Sparrows Capital appoints Raymond Backreedy to its senior management team. Mark Northway looks at the rise of populist movements and the growing prominence of political risks. Buffett's Bet! Mark Northway reviews Warren Buffett’s illuminating annual letter to Berkshire Hathaway’s shareholders. Mark Northway delves into the FCA Asset Management Market Study and discovers that the regulator's findings represent a welcome vindication of Sparrows Capital's beliefs and philosophy.